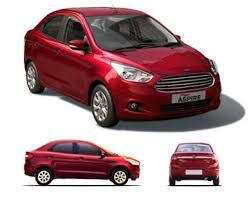 The Ford Figo Aspire will be available with two petrol and one diesel engine options. The 1.2-litre four cylinder petrol and the 1.5-litre turbocharged four-cylinder diesel will come mated to the five-speed manual gearbox, while the 1.5-litre petrol will be available with a six-speed dual-clutch automatic transmission. The 1.5-litreTDCi diesel is tuned to produce 99bhp and 215Nm of torque making it the most powerful car in the segment, marginally higher than the Honda Amaze. At standstill and low speeds, the engine is harsh and there is prominent clatter in the cabin, also a light buzz can be felt on the steering wheel and pedals. The harshness goes down as the rpm increases and engine feels pretty smooth over 2,000 rpm. We are however willing to live with it for the kind of performance it has to offer. The car is quick, getting to 100kph is easy and cruising in triple digits even more so. There is no turbo lag and the healthy bottom-end torque helps quickly getting from 60kph to 100kph without downshifting to the fourth gear. The clutch is light and easy to use even in the city traffic, though the gear shifts require a little extra effort. The ARAI efficiency of the diesel car is rated at 25.83kpl and we managed to get 15.5kpl in our test drive. The petrol car on the other hand feels relatively underpowered. The Ti-CVT is good to deliver 87bhp and 112Nm, though the tuning, as expected, has been for efficiency. The engine refinement is top notch and driving around in the city is going to be comfortable. The performance isn’t too bad, it can get off-the-line quickly and there is decent midrange to get to 100kph in respectable time, but going past 120kph requires some efforts. The engine needs to be put under lot of stress, though we didn’t mind doing that since it sounds incredible at high rpms. While the ARAI efficiency of the petrol is decent as well at 18.16kpl, we expect the real time efficiency to be much lower at around 12kpl. The 1.5-litre petrol was not part of the first drive, though we are looking forward to driving it soon. Our experience with the Fiesta AT tells us that the dual-clutch PowerShift transmission is fantastic and the 110bhp and 136Nm will feel even better in the smaller, lighter car.